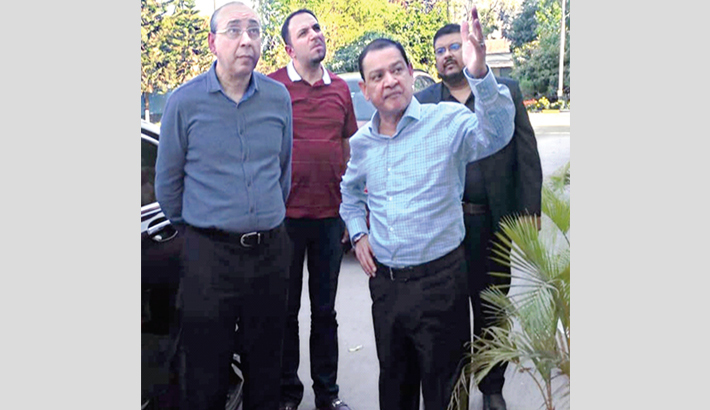 Summit Group Vice-Chairman Jafer Ummeed Khan and Azerbaijan Ambassador to India and Bangladesh Dr Ashraf Shikhaliyev pose for a photo after visiting Summit Narayanganj Power Plant in Narayanganj recently. The newly appointed Azerbaijan ambassador to Bangladesh Dr Ashraf Shikhaliyev recently visited the Summit Narayanganj Power Plant. He was accompanied by Deputy Chief of Mission Babak Ahmadov. Dr Ashraf Shikhaliyev, also an ambassador to India, Bhutan, Maldives, Nepal and Sri Lanka, has been impressed by the good management and the site of the plant. “I was highly interested to get to know the work process of the power plant. Now I am impressed seeing the overall operation as well as the beautiful site of the plant,” said the ambassador after visiting the plant. Azerbaijan and Bangladesh shares a warm bilateral relationship. During the independence of Azerbaijan in 1991, Bangladesh recognized it at early stage. Bangladesh exports pharmaceuticals products to Azerbaijan.